The Sister Mederos focuses the author’s skill and penchant for worldbuilding and character into a new world and new series involving two scions of a fallen merchant house determined to revive their family’s place. There is a very good sense of geography and place in the book. The book lacks a map, and might have been better with one of the city. However the author clearly have a sense and a perspective of where everything lies in the city and how that terrain and layout are important to character and plot. Port Saint Frey has a real weight of location, and I am sure that if I asked the autho about where I should stay and eat were I to somehow visit the city, that the iceberg of her worldbuilding of the place would allow her to immediately give me recommendations of places that don’t even appear directly in the narrative. Port Saint Frey is a character of its own, a port town, with a tech and social mix that mainly feels like Regency England, with some anachronistic cultural bits that feel about a hundred years ahead of that time. I appreciate the mix and match here, showing that fantasy cultures do not have to be exact replicas of a time and place on Earth. The sisters themselves are an interesting pair of characters. The book seems determined to ask and explore the question: “Can the siblings trust each other?” even as both hide secrets and plans from each other, and especially from the family. They make for a classic pair, given their dire straits, the golden child who is (now was) the hopes of the family, and the younger “screw up”. The author does an excellent job in not only exploring these tropes and ideas, but undermining them by the actions and choices Yvienne and Tesara make in the course of the story. Going in, I was certain as to which sister was which as depicted on the cover art, given the base personalities, but was soon proven very wrong. Along with the worldbuilding, it is the personalities of the sisters and their character development that works the best in the novel. The writing trends toward relatively short and sharp chapters, flipping between the points of view of the two sisters at various junctures. The style and layout and the overall writing skill from the author encourage a “just one more chapter, they are short” sort of pull through on the reading, which makes the book a rapid, pleasant read. As strong as those elements are, I did unfortunately find a few weaknesses in the novel. I wasn’t entirely certain about the subplot regarding Tesara and her eldritch powers--the novel takes a while to make definitively clear that they are real, but was the question of her sinking the fleet meant to be a real question, or just one in her own mind? This subplot does get in the gears a bit of Yvienne’s nocturnal exploits and investigations of the family misfortune, and I wonder if that subplot only really best serves as an alternate thread rather than one more fully formed. And I admit to a bit of a “Fridge moment” once the antagonist’s plot and full scale of how and why they did what they did came to light. Overall, the setting and character development are much stronger than some of the plot elements. Although there is a sequel now out (Fog Season), the novel does have a strong off ramp for readers who want to make their stay in Port Saint Frey a one and done. In point of fact, the book is rather aggressive in wrapping up the plot threads by the end of the novel. This briskness in tying up loose ends, too, might be a bit abrupt and neat for my taste. 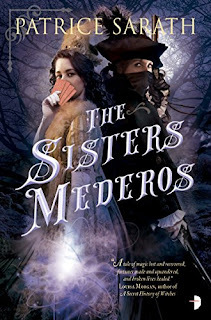 Overall, though, the overall experience of The Sisters Mederos is a positive one, and I enjoyed my visit to Port Saint Frey and its characters.